Evolving social norms and scientific research presents industry with market expansion opportunities. Las Vegas, NV, January 29, 2019 --(PR.com)-- Christine Crnek, co-founder, CEO of Arsilica, Inc. announced that recent research points to tulip glassware as a previously unidentified cause of female exclusion among straight spirits drinkers. 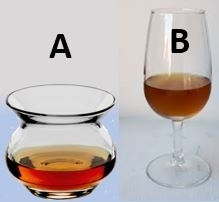 Research: In a simple AB preference test, 98% of females preferred an open-rim, engineered nosing vessel which diverts ethanol (A), over the tulip which concentrates ethanol (B). Also, 30% of females refused testing, averse to olfactory pain from tulips. Among males, 87% preferred (A), none experienced olfactory pain. The conclusion: Diverting ethanol ensures more comfortable drinking experiences. Download: https://www.mdpi.com/2306-5710/4/4/93. · Replace biased tasting methods with science-based gender-neutral education regarding nosing and evaluating. Conclusions: Everyone has the right and privilege to use their vessel of choice, but supporting science-based education empowers the consumer with knowledge to choose wisely and contributes to raising spirits’ quality bar. An inclusive, community-based, gender-neutral social stance benefits the spirits industry and consumers, and more females will enjoy straight spirits without social pressures forcing an unwanted choice between identifying with a male dominated drinking societies and improving drinking enjoyment, opening the door to expanding markets. Arsilica, Inc. Nevada C Corp dedicated to alcohol beverage evaluation research. From initial discoveries in 2002, the NEAT glass was developed, patented and introduced in 2012. Distributed USA, Europe, UK, South Africa, NZ, Australia. Click here to view the list of recent Press Releases from Arsilica, Inc.